Germany's Beer Purity Law, known in German as the Reinheitsgebot, turned 500 years old in 2016. The law from 1516 dictates that the only ingredients used for brewing are barley, hops and water. This protects the beer from cheaper additives and and makes for an infinitely drinkable brew. This law is still followed by many major breweries in Germany - even centuries later. Look for the label of Reinheitsgebot prominently displayed on the label or go to these Munich locations to celebrate Germany's 500 year old Beer Purity Law in 2016. Munich's Oktoberfest is always a massive boozy celebration and this year's festivities are sure to draw the biggest crowds ever. Many of the Oktoberfest breweries predate the 500-year-old law, but tradition holds that the beer served in the tents meets the Bavarian Purity Requirements. Most beers are light-tasting Helles, with a heavy Dunkel (dark German lager) also available in the massive one-litre glass Maß. Taste the tradition and appreciate the purity. After Oktoberfest you don't need to leave the Wiesn (festival grounds) for more beer, just wait a couple months. If you want a similar Fest with an even more powerful punch, try Starkbierzeit (Strong Beer Season) and its "insiders' Oktoberfest" local vibe. Münchner Frühlingsfest is the little sister to Oktoberfest, offering half the crowds, better weather (usually) and just as bountiful of beers. The 2016 design features a pretzel on blue ribbon and a fresh beer - delicious. For even more festival glory around the country, refer to our post on German Drinking Festivals (Besides the Big One). Take your beer knowledge to school with the Bavarian State Exhibition. The 2016 program will focus on Beer in Bavaria and the Reinheitsgebot. Taking place at the monastary Brauerei Aldersbach (about two hours northeast of Munich above Lake Ammersee), the festival will cover different weekly themes like "beer and football” and "beer and brass bands”. What doesn't pair well with beer? Few places in Munich are as heavily touristed as Hofbrauhaus, but that doesn't make it less worthy of a visit. Established in 1589 as the Royal Brewery of the Kingdom of Bavaria, the most famous beer hall in the world is located just a few steps from the central square of Marienplatz. 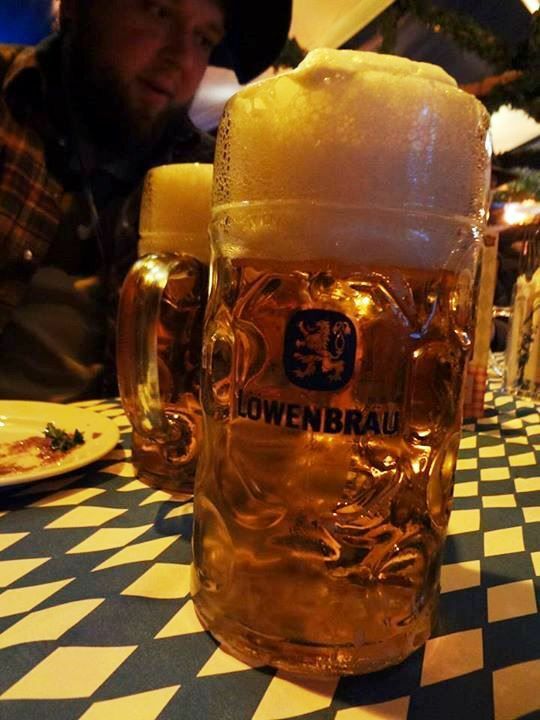 Take a seat with locals and visitors at the long, wooden tables, some over 100 years old, and listen to Oompah Bands as you dig into a Schweinshaxe with a fine Hofbräu Original beer. If you are looking for some Bavarian gemütlichkeit in the much less boisterous north, you can find a Hofbauhaus in Berlin, as well as Augustiner. If you want to study the science of beer and understand the standards that have defined a country's favorite drink for 500 years, there is no place better than Munich's Beer and Oktoberfest Museum. If you need a taste to enjoy the museum, there are guided tours and beer tastings. After all this reverent beer drinking, you will need a place to stay. Use our Munich hotel finder, or refer to our lists on nearby accommodations.